Crawl Space Ventilation - What Is It And How Important Is It For Your House? What is a crawl space encapsulation system? It is a space under some homes or under porches that can allow air that may not be good for you to filter up through the floors of the house. This is a relatively new system but it contains the crawl space from the outside by a vapor barrier. In term, an encapsulation system is installed and keeps the air of the crawl space clear. With crawl space ventilation fans, they reduce odor and any radon that could seep into your home. They will also help reduces moisture that may have accumulated and the mildew and/or mold that goes with it. Most crawl spaces require ventilation. Frequently vents are placed that allows air to flow in but not really to flow out, perhaps seep out. Fans will help the air to flow in and flow out keeping your air in the crawl space clean and fresh. Crawl spaces have a dirt floor leaving the area open for any sort of species that is cultivated by damp habitus. Air flow that is forced will help with control of all that may spawn in this area. Another item that is a necessity is a crawl space vent cover. You want to seal up this area so that nothing can get in including bugs. 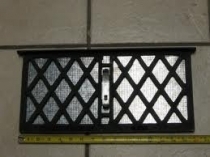 A vent cover will provide the closure and is also easy to install and has all the hardware with it that you will need. These covers should fit over what you already have as they conform to a standard vent size. You need a unit that works automatically when shopping for a crawl space power vent. What is a power vent? A power vent is a unit that runs automatically. It keeps toxins such as mold and mildew out of your crawl space. It keeps these toxins out of your air quality but it also helps your home joists and sub flooring dry, thereby preventing rot and the need for replacement. The temperature cannot be overridden in cases where it receives direct sunlight. To be effective, you will still need a barrier on the ground to have have safe levels of moisture in your crawl space. All of the above can significantly impact the health of your family and yourself. It does not take much in time and effort but gives the maximum result. You cannot assume that these issues were taken care of either when you built your home or purchased one. Consider looking into crawl space ventilation now.